Sunday, Tuesday, Wednesday, and Thursday - 5pm thru 10pm. Friday and Saturday- 5pm thru 11pm. 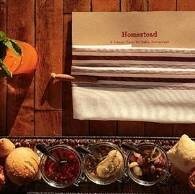 Homestead is a literal farm-to-table restaurant featuring rustic, yet elegant cuisine from executive chef Chris "Chip" Davies; specialty cocktails, wines, spirits, and beers from beverage director Patrick Henaghan; and desserts and breads from executive pastry chef Chris Teixeira. The rooftop patio of Homestead features 80 outdoor seats with full views of our L-shaped 1,000-square foot organic rooftop farm and two massive vertical hanging gardens. The light-filled second-floor interior air-conditioned room at Homestead features an additional 60 seats at tables and another 12 seats at the bar.